Why haven’t Wolfenstein and Destiny learnt from Half-Life 2’s lack of cutscenes? The next round of blockbuster shooters are just around the corner – in October, we’ve got Destiny 2 and Wolfenstein II: The New Colossus to look forward to, both of which are promising a greater storytelling experience than their predecessors. 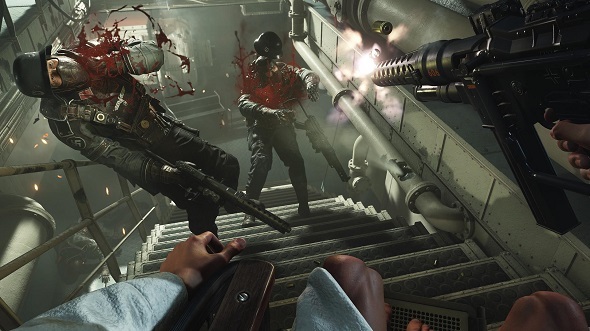 In the latter case, Wolfenstein developers MachineGames told PCGN that players can expect a “super ambitious” story with 100 actors and three hours worth of cinematics. But is that really what we want? Destiny 2 developers Bungie seem to think so. They knew they needed to step up the storytelling in their sci-fi shooter sequel after its predecessor’s failure to marry it up with the action. The problem with the first Destiny was that a lot of the more interesting parts of the story were squirrelled away on the back of Grimoire cards – there is little worse in first-person shooters than having to take a break from the action in order to read walls of text. Those cards are absent from the sequel but, unfortunately, part of Bungie’s solution to convey a more high-stakes story is to throw in a tonne of cutscenes instead. None of this is to say that cinematics are not entertaining – and the production quality on show in both Wolfenstein II and Destiny 2 shows they are far from cheap, either. But when you start sitting through one of Wolfenstein’s many interludes, some lasting upwards of a few minutes to indulge long monologues, you have to ask yourself if this approach is doing a disservice to the first-person action of the genre. It’s as if the developers have exhausted their ideas of how to convey story through gameplay, and decided instead to fall back on another medium. It seems many developers have forgotten the lessons from Half-Life 2. Valve established a form of interactive storytelling unique to games by never removing the camera from behind Gordon Freeman’s eyes. With no cutscenes, the action and the drama were woven together, not only during dialogue scenes, but also through the environmental storytelling across the game’s world, which you were free to frame for yourself. Last year’s excellent Titanfall 2 campaign certainly didn’t forget this, with its imaginative level design and mechanics telling a terrific story – having you forge a surprising bond with a titan buddy – all while never leaving the pilot’s point of view. At least the cutscenes in Destiny 2 often give a different perspective on the unfolding events, especially the scenes that involve Dominus Ghaul and the Speaker. Wolfenstein, on the other hand, has a jarring habit of pulling you out of the first-person perspective and into the spectator seat. In doing this, it appears unable to consolidate Blazkowicz the actor with his mute stuntman (that’d be you) as a cohesive whole. It doesn’t help that these cutscenes are usually pre-rendered, the disconnect reminiscent of old TV dramas that shot exterior scenes on film but cut to video once back in the studio. What is strange is that MachineGames seem to be beholden to this crutch. They have already shown in The New Order that they are perfectly capable of creating memorable scenes without pulling you out of the moment. Who can forget the tense introduction to Frau Engel on the train carriage, all seen through Blazkowicz’s eyes? Early gameplay of The New Colossus shows this hasn’t been lost entirely, too: in one mission, you walk the streets of Roswell in the middle of a Nazi parade before entering a diner and enduring an equally chilling encounter with a milkshake-slurping Nazi officer. But then, frustratingly, you are dropped back into another cinematic for the rest of the scene. That’s not to say I think the game should descend into relentless Nazi-killing – something the New Orleans mission Jordan recently played seems to do. Player action needn’t be divorced from world-building. Surely that is the advantage of a first-person perspective: to allow us a more intimate connection with the people and scenarios we encounter, going through thick and thin with them – whether it is a near-death encounter with an amped up Nazi machine, or a quieter moment whispering in the dark – all without leaving their side. Look, developers, your cutscenes are well acted and directed, really they are. But maybe you could save them for genres in which their deployment doesn’t risk undermining players’ relationship with your characters and game worlds.